The so-called Kazakhgate inquiry commission in the Belgian Parliament is about to conclude its workings. The parties forming the majority apparently wish to make the commission stop until 21 July at the very latest. What have we found so far? According to Dirk Van der Maelen, the commission’s president, what we found is very different from what we expected to find. He confirms everything that OSI has revealed. Earlier this month, Dirk Van der Maelen gave an interview for the Belgian magazine Knack. “So behind the settlement law it is not the billionaire Patokh Chodiev, but the diamond lobby?,” ask Knack’s Kristof Clerix and Peter Casteels. The Haelterman that Van der Maelen refers to is Axel Haelterman, a lawyer and a law professor working for the Antwerp World Diamond Centre, an umbrella-foundation representing the interests of the diamond traders in Antwerp. This is a very important statement. Van der Maelen clearly states that “no people related to Chodiev” interfered with the legislative process of creating and adopting the settlement law. Neither Catherine Degoule, Chodiev’s French lawyer, nor Armand De Decker or any other. 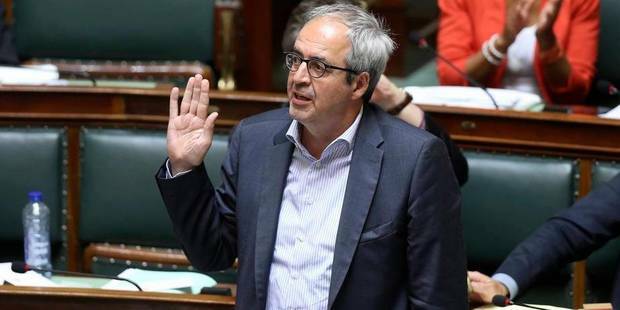 Therefore, the story according to which Chodiev somehow maneuvered to change the Belgian law – a story wildly circulated for years by the Belgian media – is false. Adding insult to injury, the Belgian Parliament created an inquiry commission based on this widespread fake story. One very important conclusion that follows from Van der Maelen’s statement is that if there was no interference with the legislative process from Chodiev and his people, then there was no interference from France also. In simple words, if Chodiev didn’t change the Belgian law, then France, who was supporting Chodiev by offering him a team of lawyers, didn’t change it either. Those responsible for the settlement law were Belgian politicians and Belgian interest groups, with no pressure coming from abroad. Van der Maelen clearly states that “the fathers of the settlement act are the diamond sector and the College of General Prosecutors, under the political responsibility of the CD&V.” In other words, it is the Flemish Christian-democrats (CD&V), and not the French-speaking Liberals (MR) who fathered the settlement law. There are two political parties who for years claimed that MR was responsible for this law: the Greens (Ecolo), and the left-liberals (DeFI). Based on this claim, they fought to create the present inquiry commission. Since the claim is false, according to Van der Maelen, both Ecolo and DeFI face ridicule (to say the least). There is no way one could take these statements lightly. First of all, Van der Maelen is no supporter of Chodiev. Nobody could think that he is trying to favor the Uzbek oligarch. He is no friend of MR either. On the contrary, he and his party (SP.A) are opposing the liberals in any way they can. If he would have found any connection between Chodiev and the settlement law, or any role played by MR in the creation of this law, he would have been the first to let the world know about it. But, in his own words, he found nothing except CD&V’s responsibility and the interference from the diamond lobby. Second, Van der Maelen is not simply expressing an opinion. He made this statement as president of the inquiry commission, after more than six months of investigation, after hearing many people involved in this affair, and after seeing many documents related to this case. His is not an opinion, but an educated conclusion, based on hard evidence and formed after a thorough inquiry. Therefore, what he has to say on this subject cannot be easily dismissed. Given these revelations, confirmed publicly by the commission’s president himself, it is very difficult to understand why this commission is referred to as the “Kazakhgate” commission. Another widespread story claimed that, even if Chodiev and his business partners, the so-called “Kazakh Trio,” had nothing to do with the settlement law, their transaction with the Belgian prosecutors in Brussels was nevertheless illegal. This story was also proven false by both Patrick de Wolf, the former Chief Prosecutor in Brussels, and Marc de Le Court, the former General Prosecutor of Brussels. They both explained that there was nothing illegal concerning the settlement. According to the Belgian Code of Criminal Procedure, even if Chodiev would have been found guilty by a judge, the sentence could not have been but a fine, because in this case a court found that the threshold of reasonable delay has been overstepped. Therefore, Chodiev’s case was eligible for settlement according to the law voted on 14 April 2011. To sum it up, everything the Belgian public thought it knew regarding Kazakhgate is wrong. There was no interference from Chodiev’s people in the legislative process. Therefore, there was no interference from France. The settlement law was created by the Belgian diamond sector and the College of General Prosecutors, under the political supervision of CD&V. There was nothing illegal in Chodiev’s settlement with the prosecutors in Brussels. His settlement wasn’t even the first one that was agreed after the law expanding amicable settlements was voted on 14 April 2011. These are the conclusions of none other than Dirk van der Maelen, the president of a commission that for six months investigated this affair. These false stories circulated for years in the Belgian media. They were given credibility because politicians like Georges Gilkinet kept repeating them. Ecolo and DeFI used them within the inquiry commission to try and score political points against their opponents, and thus turning the investigation into a mockery. Based on these fake stories, the Belgian public, especially the French-speaking one, was kept in a state of moral outrage, and a commission of inquiry was established by the Belgian parliament. It turns out that the public was duped, and the parliament spent a lot of time, money and resources chasing the bogeyman invented by Ecolo and DeFI. This is probably the worst case of public and political intoxication with fake stories in the history of postwar Belgium. Of course, some political parties, some politicians and some news outlets will have to pay for this intoxication. However, a very important question remains unanswered: how was all this possible? Who was behind this intoxication? OSI will soon offer an answer.